Windows 10 enables an entire family, roommates, or employees in a small office to share a single computer or tablet. The computer keeps track of everybody’s programs while different people use the computer. Mom can be playing chess and then let Jerry sign in to check his e-mail. When Mom signs back in a few minutes later, her chess match is right where she left it, pondering the sacrifice of her rook. To open the Start menu, click (or tap) the Start button or press the keyboard’s Windows key. Click your user account photo in the screen’s top-left corner. A menu drops down, as shown here. The menu lists the names of all user accounts authorized to use the computer. Choose the name of the user account holder who wants to sign in. Windows leaves you signed in but immediately fetches the other person’s account, letting him type in his password. 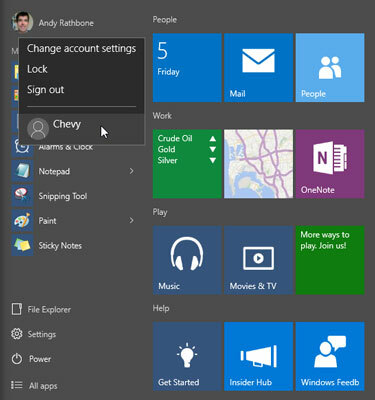 When that person finishes with the computer, he can sign out just as you did in Step 2 — by clicking his user account photo in the Start menu’s upper-right corner. This time, however, he’ll choose Sign Out. Windows closes down his session, letting you sign back in with your own password. And when Windows reappears, so will your work, just as you left it. With all this user switching, you may forget whose account you’re actually using. To check, open the Start menu. The current account holder’s name and picture appear in the menu’s top-right corner. To see other accounts currently signed in, open the Start menu and click the current account holder’s name. A drop-down menu lists the other user accounts but places the words Signed In beneath the name of each account holder who’s currently signed in. If a Standard account owner tries to change an important setting or install software, a window will appear, asking for Administrator permission. If you want to approve the action, just step over to the PC and type your password into the approval window. Windows lets you approve the change, just as if you’d done it while signed in with your own account.